In a decent sized bowl, combine eggs, milk, garlic, salt and pepper. Using a wire whisk, whisk the mixture until the eggs are frothy. In a small-medium skillet, melt the butter on medium heat. Pour all of the egg mixture into the skillet and reduce heat to low. Let the omelette cook until only the middle is still slightly undercooked. The secret to minimal mess is letting the omelette cook long enough. Make sure the edges are firm and you see it begin to bubble in the middle. Add the shredded cheddar cheese, ham and chives to one half of the omelette. Using a wide spatula gently lift the plain half of the omelette and fold it over the meat and cheese. Let the omelette cook for a few minutes. You can use your spatula to peel up the omelette flap to see if the cheese is melting. Once the omelette is cooked, tilt your pan and use your spatula to slide the omelette out onto a plate. Garnish with sour cream and fresh tomatoes or parsley. Spinach Parmesan – Add fresh spinach and Parmesan cheese in place of the filling above. Hash Brown – Cook a serving of breakfast potatoes or hash browns and use them as a filling for your omelette. Vegetable – Use tomato, onion and mushroom or other quick cooking vegetables to create a tasty variant. How do you make an omelette without under or overcooking, and not spill ingredients everywhere? Can it be done? Sure – we’ll show you how. What’s more difficult — figuring out the proper spelling of omelette or cooking one? Is it omelet or omelette? Depends on who you ask and how they’re feeling that particular day. It seems most people have settled on omelette as the proper spelling although omelet is recognized as the same light, thin egg dish that has become a staple of great morning breakfasts around the world. The basic ingredients you'll need for an omelette are: Eggs Milk Seasoning (salt, pepper, fresh herbs, garlic powder, other favorites) Butter Cheese (typically cheddar, but you can get creative) Meat (typically ham, but sausage and other meats work too) Onion and other veggies (red or green bell pepper, mushrooms, tomato, asparagus, etc.) Although ham and cheese is considered an American classic, there is no limit to the number of creative and tasty omelettes you can come up with. Here are just a few more ideas: Spinach Parmesan – Add fresh spinach and Parmesan cheese in place of the filling above. Hash Brown– Cook a serving of breakfast potatoes or hash browns and use them as a filling for your omelette. Vegetable – Use tomato, onion and mushroom or other quick cooking vegetables to create a tasty variant. 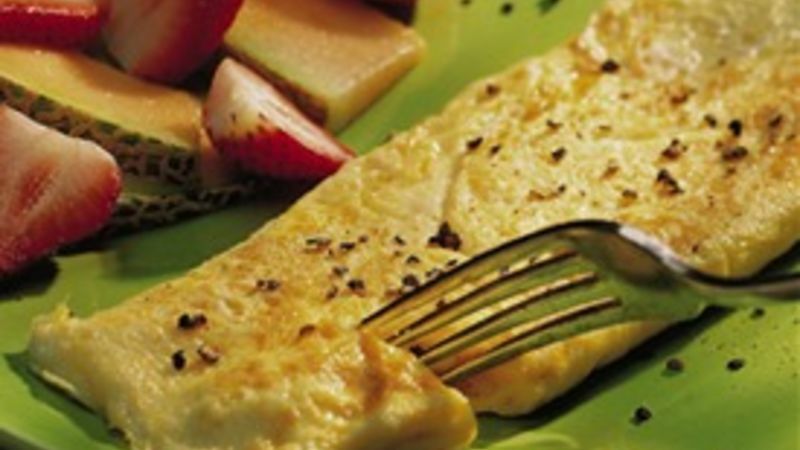 Omelette Recipes Omelette fillings vary as much as personal taste. So, experiment with different ingredients to find your own personal fave. An omelette with Canadian bacon filling in lieu of ham is a tasty alternative, for example. Or you might try an omelette topped with mushroom cheese sauce for an easy breakfast recipe that looks entirely upscale. Or, speaking of easy gourmet recipes, how about a Greek omelette with feta cheese and spinach. Yum! And don't forget the classic Denver omelette with onions and bell peppers, or my personal favorite, the garden omelette, loaded with fresh veggies. Don’t be afraid to try something new—you might end up with an awesome new favorite omelette!